Your packed and useful travel guide for everything you need to know about Sao Paulo for an unforgettable trip to the city. The largest city in Brazil, Sao Paulo is one of the most enjoyable cities in the world to explore. As it has been home to people from many different nations, the cultural diversity in Sao Paulo contributes to the aura of the city and makes it even richer. The first thing to come to mind about Sao Paulo is usually the population. There are more than 11 million people living in the city, the number becomes 20 million when the metropolitan area is included. It is one of the most densely populated countries in South America. This eventually causes the traffic to become a chaos, especially in rush hours. There may be times in Sao Paulo when reaching a place might become an actual challenge due to the heavy traffic jams. However the city is such a beehive when it comes to places to see, museums, bars & clubs and attractions that in the end you end up thinking it is totally worth it. 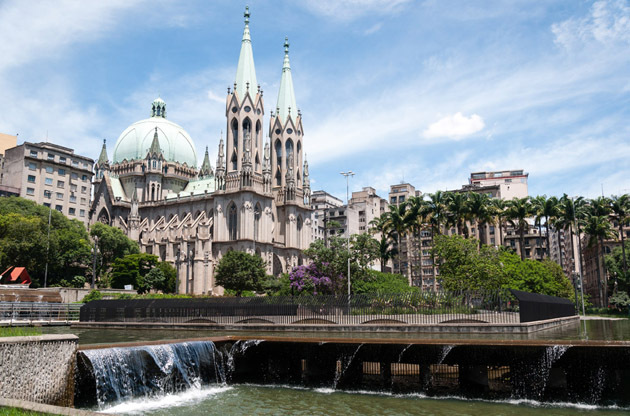 Sao Paulo, which is also called Sampa by the Paulistanos (the locals of Sao Paulo), is one of the most underrated cities in Brazil, when its fame is compared with Rio or Salvador. However while wandering in the streets of the city or enjoying the excursions nearby, you will notice how wrong this sort of an anticipation. Sao Paulo has got a unique culture and a way of living that separates it from the other major cities in the country. The Sao Paulo experience is going to be very different from your other travels since the city itself makes you feel like you are on a different planet, in a faraway galaxy. Let the rhythm and the joy of the city captures you while you are there. Sao Paulo is located on the mid-east of Brazil. How to get to Sao Paulo? Sao Paulo has got 3 airports. If you are flying from another country, you will probably arrive to Guarulhos Airport, which is located 40 km from the center. To reach there or the Sao Paulo center from the airport, you can check the options here . Congonhas Airport usually hosts domestic flights or flights from nearby countries. The ways to reach the airport or the center from there is given on Congonhas Airport’s website . In addition to these two, Viracopos Airport also serves a bunch of flights and it is located 99 km from San Paulo center. How to get around in Sao Paulo? As I have already told before, because of the density of the population, reaching one place from another might be a problem, especially in peak hours. The best option to avoid spending time in the traffic might be using public transport. Sao Paulo Metro is highly efficient and it is easy to use, and it is the most convenient way of transportation in the city. The buses in the city is managed by 3 different companies, however a route planner and schedule for all the buses can be found on SPTrans . The suburban rail system may also be a good choice if you are planning to visit outskirts of the city. The light rail system is operated by CPTM and the website includes a detailed map and a schedule. Sao Paulo is one of the cities that never runs out of things to do in Brazil. You may have to plan your everyday in advance in order to not miss out something. You may start seeing the city from the famous Paulista Avenue. This is the place where the locals are proud of the most in the city. Rua Augusta, Alameda Santos and Rua Oscar Freire are the surrounding areas and you can find a lot of interesting galleries there. Rio Pinheiros area is also worth a visit. Museu do Ipiranga and Memorial da América Latina are the top two museums in Sao Paulo and I can assure you that you will enjoy both of them if you are into museums. Museu de Arte de São Paulo and Museu de Arte Moderna are the other two famous museums in the city. If you would like to shop outside the malls, then the area Rua 25 de Março is the place you should head directly. Expect a huge crowd as it is a top shopping area for the Paulistanos as well. Rua Oscar Freire and Brás neighborhood are also good choices to find authentic Brazilian products. Of course, if you are out of time and would like to do all your shopping in once place, then Sao Paulo malls may help you. Some of the most famous are Eldorado, Iguatemi, Aricanduva and Frei Caneca. I don’t know about your eating habits. But I do know one thing; if you don’t visit a churrascarias, which is a grill house, in Sao Paulo, then your trip is not valid. Feijoada is a regional dish of Sao Paulo and it must be tried out too. As the city has got a lot of people from many different nations, don’t be prejudiced about the Japanese, Italian and German restaurants you’ll come across. Vila Madalena area is famous for being the best area to find any kind of restaurant at any price range. Sao Paulo has got a vibrant night life scene and you will find the right place for you easily. The top areas in the city to relax are Vila Olímpia, Vila Madalena, Barra Funda and Santana. As well as having a shiny city life, Sao Paulo also offers a bunch of excursions to the ones who would like to get away from the metropolitan area. There are daily tours from the city to hike, ride horses, climb and swim. All these are done in the arms of the nature. Trips to coffee fields are also among the popular activities. Capova, a Brazilian farm is nearby and it is among the top destinations of travelers. One of the major cities of Brazil, Sao Paulo is home to a large number of international events. These conferences, fairs, tradeshows, exhibitions, congresses and symposiums attract thousands of attendees from all over the world every year. When the characteristic features of the city and the charm of Brazil come together and the venues that have the adequate equipment to host these is added, Sao Paulo becomes one of the most interesting cities to join an event in.